Citation Information: J Clin Invest. 2007;117(4):978-988. https://doi.org/10.1172/JCI29176. Goblet cell hyperplasia and mucous hypersecretion contribute to the pathogenesis of chronic pulmonary diseases including cystic fibrosis, asthma, and chronic obstructive pulmonary disease. In the present work, mouse SAM pointed domain-containing ETS transcription factor (SPDEF) mRNA and protein were detected in subsets of epithelial cells lining the trachea, bronchi, and tracheal glands. SPDEF interacted with the C-terminal domain of thyroid transcription factor 1, activating transcription of genes expressed selectively in airway epithelial cells, including Sftpa, Scgb1a1, Foxj1, and Sox17. Expression of Spdef in the respiratory epithelium of adult transgenic mice caused goblet cell hyperplasia, inducing both acidic and neutral mucins in vivo, and stainined for both acidic and neutral mucins in vivo. SPDEF expression was increased at sites of goblet cell hyperplasia caused by IL-13 and dust mite allergen in a process that was dependent upon STAT-6. SPDEF was induced following intratracheal allergen exposure and after Th2 cytokine stimulation and was sufficient to cause goblet cell differentiation of Clara cells in vivo. Spdef mRNA in mouse respiratory epithelial cells, trachea, and tracheal glands. (A) SPDEF and GAPDH expression was identified by RT-PCR using RNA extracts from human lung adenocarcinoma H441 cells, cervical adenocarcinoma HeLa cells, normal human tracheal epithelial HTEpC cells, SV40 large T immortalized mouse lung epithelial MLE-12 cells, mouse lung (mLu), and mouse trachea (mTra). Spdef mRNA was detected in H441 cells, HTEpC cells, and mouse lung and trachea, but not in HeLa or MLE-12 cells. PCR without RT (–) showed no product. 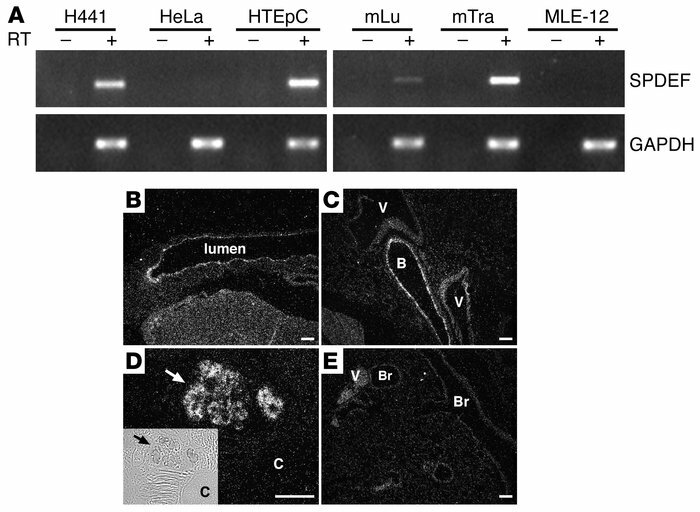 (B–E) In situ hybridization for Spdef mRNA was performed on sections of trachea and tracheal glands (B and D) and lung (C and E) in adult mice. Spdef mRNA was detected in the epithelium lining trachea, bronchi (B), and tracheal glands (arrows), but not in bronchioles (Br) or blood vessels (V). Inset shows phase microscopy of the hybridized tracheal glands; original magnification, ×4. Scale bars: 200 μm. C, cartilage.